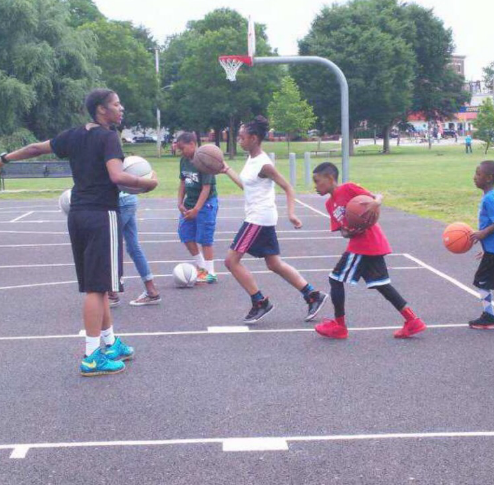 Khadija Bowens is an inspiration to the youth of North Philadelphia. She is a beacon of hope to many of the neighborhood children. Bowens refused to be a product of her environment by realizing she couldn’t get ahead on her own, but with the support of her community and teammates. She has overcome many obstacles along the way but has proven to beat the odds while doing so. From growing up in an abusive household to the unexpected passing of her brother, she has shown that it’s not where you come from but how you finish. The former Temple University Student is now paying it forward by using her past struggles to teach the youth in her community to dream big and always remember that no matter where you might come from you can always rise above it. I enjoyed speaking with Khadija and getting to know her and what makes her the remarkable woman she is today. With her two hashtags #payitforward and #biggerthanbasketball Khadija has made great strides in her neighborhood thus far. Take a moment to read the following Q & A interview to get a better understanding of who she is and her contributions to her community. Kiersten: For those who don’t know, introduce yourself and tell us who Khadija Bowens is. KB: My name is Khadija Bowens, I hail from the North Philadelphia area of the city. I went to University City High School in West Philadelphia where I won a public league championship over there. I was fortunate enough to earn a full athletic scholarship to Temple University where I began a lot of my community work, actually in high school. I do a lot of different things in the community, again like I mentioned I played basketball. I was pretty good if I must say so myself. I was always committed to my community. I think that had to do with a lot of the decisions I made prior to graduating college. I felt like I owed it to my community and the kids in my community to do some things differently and pay it forward which is why I extend myself to those children. I don’t have a non-profit organization right now but I like to reach out to the kids and show them it’s a better way and it’s more to life than where you come from. I think you should get to know me because I feel like it’s our responsibility and obligation to take care of our kids because they’re our future. I feel like if you can invest in anything it should be a child’s future. Kiersten: What do you like about being a coach? KB: What I like about coaching I guess and taking on a leadership role in my community is the fact that I am able to directly affect a life of the youth. I know what it was like to not have a role model, to not have somebody necessarily that I had an immediate connection to or access to. I just try to be that person and I also understand what it’s like coming from the city and facing different obstacles and challenges on a day to day and you know having to be a student or athlete so just the direct effect that I know that I can have on them by being an example and showing them that you don’t have to be the product of your environment and on the basketball side just teaching the game of basketball the girls here in the city. It’s not a lot going on for them so I try to go back and link with different people to make sure I try to stay relevant and stay around the game just to encourage them to take advantage of the opportunity because I didn’t do that and help them make better decisions and hope they take it all in. Kiersten: Six time WNBA All Star Dawn Staley and yourself have a pretty solid relationship. Can you elaborate on what that’s like? KB: Well, it's funny you asked because Dawn’s Staley was like my idol that’s the only person I can look at and identify with coming up. 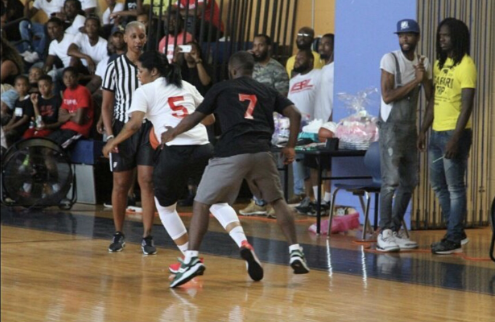 But in regards to basketball she was from North Philly that’s why I started wearing the number five. Everybody knows that I wear the number five and that’s why the number five is in my logo. She was always my idol and I paid attention to her and how well she represented not just the game of basketball but the city of Philadelphia and I always wanted to be just like her. Like I’m Dawn Staley I don’t care what anybody says. Kiersten: Tell us about K5B the brand? KB: K5B brand it’s pretty much my logo and when I thought about the logo I wanted to keep it simple. As I mentioned earlier people knew I wore the number 5 and when they see my name it kind of associates but I kinda wanted to just incorporate something different. I do different things in the community, I had a after school program so I wanted to share the 5 that represents five pillars of my program and these are the things student athletes need to be successful. KB: The youth! It’s crazy cause the way that I was coming up, I had the worst attitude. You couldn’t tell me anything. I really feel like I have to pay it forward which is another hashtag I use to motivate and inspire. I just try to use my journey and my story to motivate and I just find that basketball is something that the city of Philly loves and are familiar with and I kinda use my name as an advantage. I love the youth, I love the kids and I know that they want structure, they want discipline, want a role model, a leader and they want somebody they can look at and identify with and say ok this is what she did, maybe I can get out of it. I didn’t go to the WNBA because I feel like if I did, I wouldn’t be able to give back to the kids. I’m grateful for my journey because it’s made me who I am. Anytime someone asks me to speak I say “Absolutely” because I feel I can indirectly impact a child’s life. Kiersten: I know you’re heavy into helping the youth and the community. How does it make you feel when you see the kids’ reaction to you interacting with them and really being concerned about their future? KB: It makes me feel good because they bring me some type of joy and the youth are our future. I look at them like they next up and it’s like we pay attention to and tune into so many other things it’s like if we really just pay attention to them they’ll tell you exactly what it is they need and want and exactly how they feel. It saddens me how they’re so receptive to the love cause it’s almost like they never get it so it’s like they draw it in and it’s like I gotta keep giving it to them. I try to bring different people around and expose them to different things. I can’t wait to start my organization and get more funding so I can do more for them. I would like to service them in different areas to prepare them for life. I love and enjoy them. Kiersten: How important is it for you to stay connected to your roots at Temple University? KB: So, coach Staley is in South Carolina, and I stay connected to coach down there. I don’t really stay in touch with the Temple staff now because it’s an entire different staff from back then but we know who each other are. They’re always willing to give me tickets and things like that but I kinda connect to my Temple family cause they were the ones who were really there at some of my lowest points and grew wit me and watched me grow into the woman I am today. Kiersten: Do you have any upcoming events we should know about? KB: I do! I will keep you guys posted. I’m working on a nonprofit so I can do more for the youth. A free clinic for the girls before the year is out and the 2nd Annual Breast Cancer Charity Game coming up on October 29th. Kiersten: What’s next for you? What should we expect? KB: A nonprofit organization to service my community and youth. An after school program and training sessions. Just being more consistent and evolving as a woman. I left my job for this. GOD gave me the vision so I gotta chase it. The next five years for KB Basketball is community event after community event. Going tri-state and becoming a household name in regards to servicing the community as well as the basketball aspect and using basketball to prepare our youth for life after basketball. You can find Khadija on Instagram at, @kbowens_bball and also check her out at the women’s league for the Fall. For more info on her and the basketball league check out her Instagram.